Well, the Avatar of Shaah is assembled. Here you can see her with 3 others of my Keepers, the two Creature Caster ones on the left, and the Mierce Miniatures one which I’ve just started painting on the right. As well as the beginnings of her base made of plasticard and a yogurt lid. I’ve uploaded a small gallery of better pictures of the Avatar, as well as her completed base. For many of my more daemonic miniatures I’ve gone for a Giant’s Causeway effect on the base, and I went a little overboard on this one, adding a dozen tentacles as well. Turns out I only had 11 of them though so one I had to construct out of greenstuff. Overall I’m pleased with the base and very excited to start painting this model, as well as the other three. And my Keeper problem might be worse than I thought. I complete forgot I’d backed Toughest Girls in the Galaxy 2. Well it came today, in addition to a ton of other beautiful miniatures is The Avatar of Shaah. Over 40 pieces of finely detailed resin. I spent about two hours working on it and only got a little over halfway through trimming the flash off (admittedly I was watching Game of Thrones so was a little distracted) but still, this is definitely one of the more complex kits I’ve assembled. Aside from on the legs the mold lines are nearly invisible… And the most obvious offenders are on the back of the legs, so I might paint them like stockings with a seam at the back… Once I get them painted I’ll have to start giving them names as well. Eldritch emissaries of Slaanesh are people too right? Slaaneshii Furies. That said I’m also thinking about converting them to be more Raptors or Warp Talons… I think they’d be pretty good Warp Talon stand-ins. That said there is also any hope that Emperor’s Children and Slaanesh Daemons will be getting some love soon. 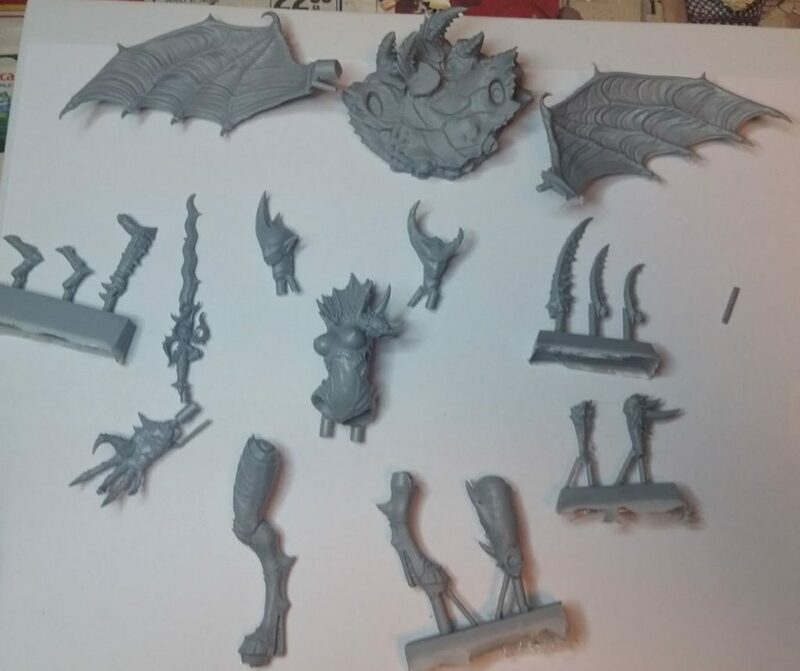 GW is just releasing a Start Collecting Slaaneshii Daemon’s box for Age of Sigmar and there’ve been rumours of a revised Fulgrim for quite a while now. And basically all three other ruinous powers have received love; it’s certainly Slaanesh’s turn if anyone’s. Before painting a model, there are a few things you can do to increase the durability of your paint job and ensure your masterpiece isn’t ruined by banging around in a box with other minis or being dropped on the floor or mishandled by an opponent with greasy hands (and some things to do afterwards). However by far the most important aspect is priming your model. You’ll have folks tell you it’s not important, or to just brush on your base coat. If you’re going to always handle your models with utmost care and only keep them on the shelf that’s fine. If on the other hand, you plan to actually play your game of choice then your models are going to see use and abuse. They’ll tip over, get dropped, get stuff dropped on them, get handled, and bump into things. A good start can ensure your terrific or terrible paint job will last for years! The first step is to wash your models… now with most GW plastic you can pretty safely skip this step. However it doesn’t hurt (aside from taking a bit of time to dry) and many other models, especially resin (including Forge World resin) this step is essential. Most of the time warm soapy water and a very light scrubbing with an old toothbrush is sufficient. Rinse and let dry, and you’re good to go. The second step is to prime your models. If you’re painting a display model, then aside from basing coating it, this step isn’t that important… I’m going to assume you don’t want your models to chip, and you want your base coat to be able to go on in just one or two thin coats. There are a wide variety of paint on primers, and those all you really have to do is stick to the “multiple thin coats” adage and you’ll be fine. Another option is using an airbrush, which can work better than rattle cans, but for most of Spray primer is both economical and efficient, so I’m going to go into detail on how to get the best result when spray priming. Never spray (primer OR varnish) if the humidity is over 55%. You might be able to get away with it as high as 65% but do a single test model (or a piece of sprue) and make sure… 50% or less and you should be safe. If it’s raining or snowing, don’t even bother. If you have access to a climate controlled area (garage w/ AC for example) you have a lot more leeway since Air Conditioning will draw a lot of the moisture out of the air. If you’re not positive, test on some sprue to make sure. If the temperature outside (or where ever you are spraying) is warmer than inside, soak your spray can in warm water for about 5-10 minutes beforehand. Also if you haven’t used the can in a while, shake, soak, shake can make a big difference. I generally soak then spray every time. Shake that can! Shake it good. For about 1-2 minutes. I’m serious, you think you’ve shaken the can enough, you haven’t. Shake it up and down. Swirl the can so the agitator rolls around the bottom. Hold the can upside and do the same thing. Any shaking that you do before the agitator starts rattling doesn’t count. If you are going to soak the can in warm water, shake before AND after the soak. Start and stop spraying NOT aimed at your models. The initial and final bit of spray can clump up. I also usually do a test spray into the air to make sure it’s coming out smooth. If the spray seems clumpy or stringy or weird go check the weather, or if it’s a new can check your return policy. Spray from about 8-16″ away. You might have to get a bit closer if it’s windy, but better to be too far away and have to do two coats. Speaking of which go for light coats…. Always better to do 2-3 coats then one way too thick coat that you can’t undo without stripping. Keeper of Secrets needs a bath (most resin models do!) Click to Embiggen. I might have a problem. No, GW has a problem. If they would release some new Slaanesh Daemons or Emperor’s Children models I’d give them my money. However they haven’t, and probably won’t for the near term future, so in my desire to expand my Slaaneshii army I end up turning to third party models. This, my 5th Keeper of Secrets, just arrived today. 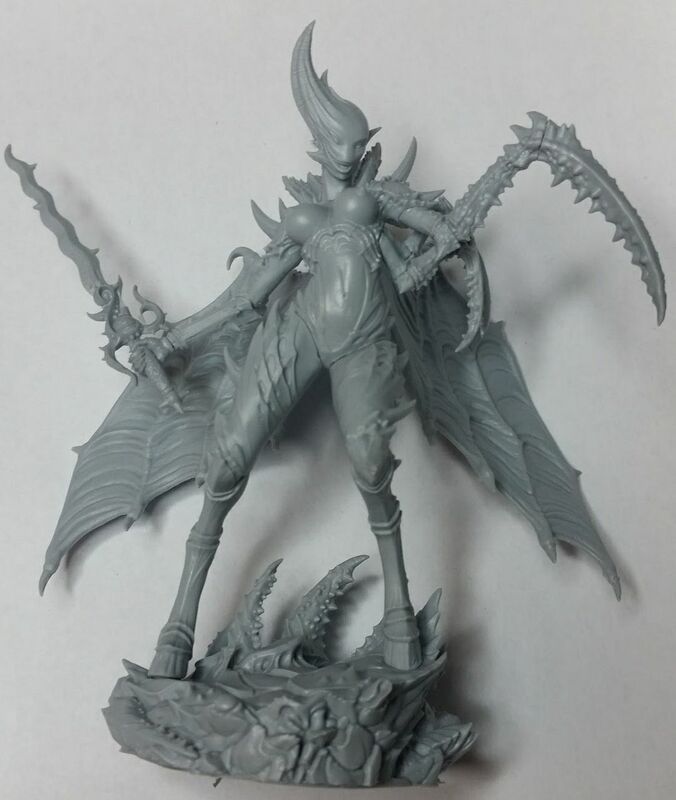 I was exceedingly pleased with the Creature Caster Spider Demon (the first of the 3 KoS I kickstarted, and the last to arrive) so when my friend Rick told me they’d made a new Demon I couldn’t resist picking up the Lady of Corruption. She’s a bit smaller so might be better as a Daemon Princess, though I don’t know how well Khaslillie would deal with competition. If you are interested in alternate Keeper of Secrets models, I also highly recommend the Pleasure Demon from Mierce Miniatures. I also have two Lords of Lust from Titan-Forge. They are really much too small to be a good Keeper of Secrets, and they might be a bit big for a Herald. 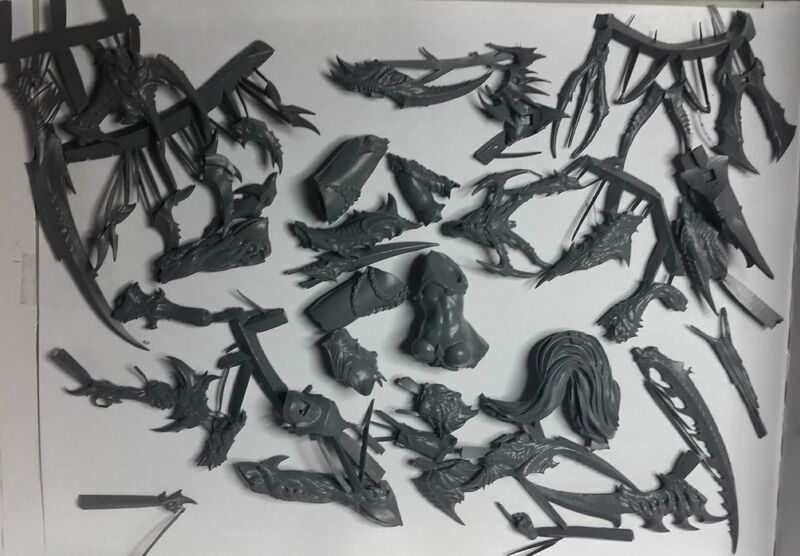 That said, the Banshees of Lust make excellent alternate Daemonettes, especially if you don’t like the aesthetic of the new models and can’t get your hands on any of the Diaz one.